When I was on the Kona side of Hawaii Island, a friend who lived there told me they go to Hilo to eat. After having visited, I can understand this. While there is some spectacular food on the Big Island – fresh, locally-sourced, and sometimes pretty pricey, there’s something to say for good old home-style comfort foods, and I think this is really something that Hilo does exceedingly well. 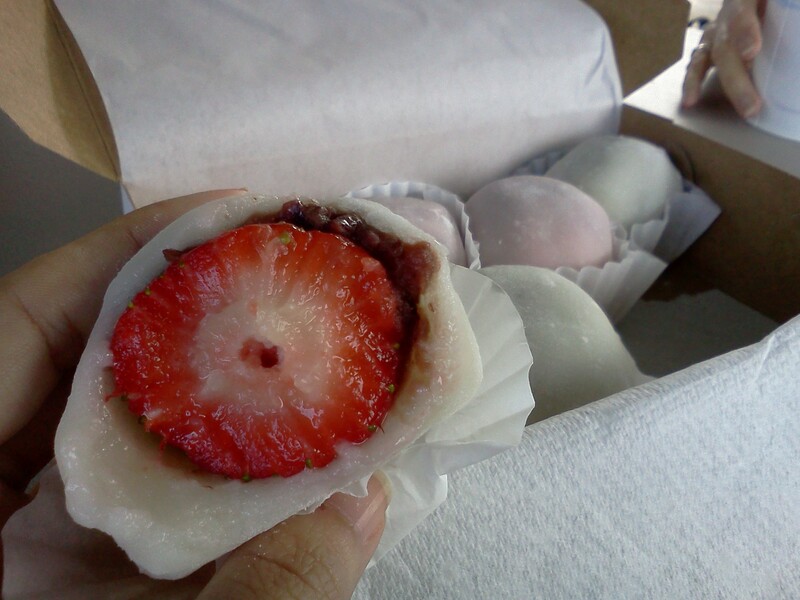 When I asked around for where to eat in Hilo, EVERYONE recommended the strawberry mochi at Two Ladies Kitchen. It’s recommended to call ahead but we were pretty lucky since they still had some available. We also were able to sample fresh grape mochi while we were waiting and bought a big sampler pack to try out some of the other varieties. My favorite is still the strawberry though – made by hand with a thin layer of sweet adzuki bean paste around a HUGE fresh strawberry, this was mouthwatering. I ordered two half-dozen boxes but somehow got 8-packs instead. Score! This is the perfect omiyage to take home with you as a souvenir from your trip – if you can keep yourself from eating it all. More info and Yelp Reviews here. 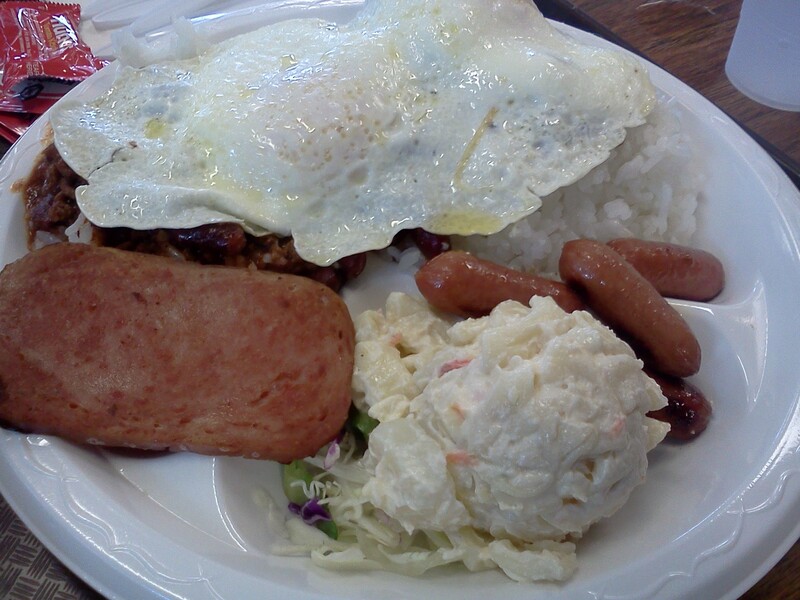 It is said that the loco moco was invented in Hilo, and Cafe 100 has been serving them since 1949. In fact, today they have over 30 varieties and serve over 9000 per month! If you’ve never had a loco moco, it’s a popular Hawaiian menu option – a hamburger patty topped with a fried egg and smothered in brown gravy and served over rice. I love it with an over-easy egg so the yolk runs into the gravy, top it with a little tabasco or chili pepper water, and you’re all set! Tasty, filling, affordable, and easy, whether you get the “original” or one of the many new varieties, this is a must-try when in Hilo. …45 minutes later (without an apology for the delay) the saimin finally arrived. I wish that I could say it was worth the wait, but it wasn’t. Some of the other dishes we saw go out during our wait looked pretty good and left me with a case of order envy, but the saimin (and the service) was disappointing. 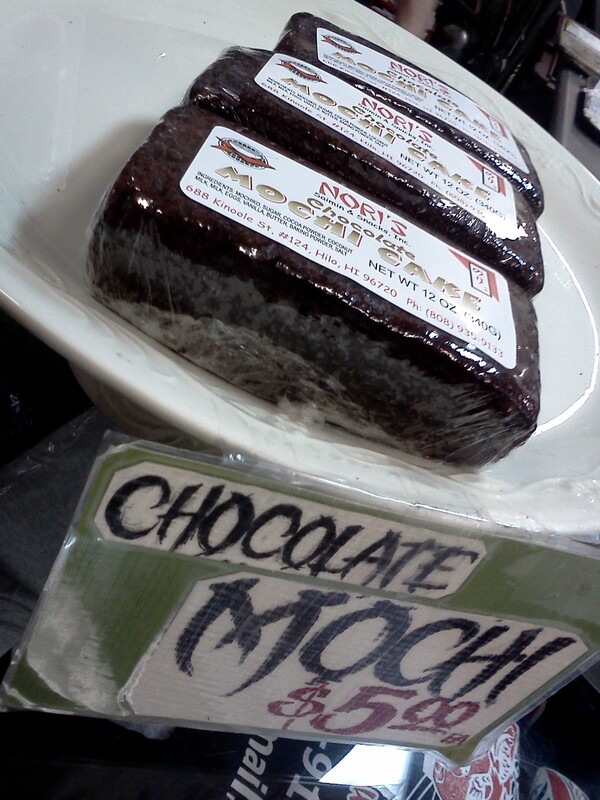 The only thing that really saved the experience for me was purchasing a loaf of the famous chocolate mochi cake. I’d go back just for that, but otherwise I wouldn’t really recommend Nori’s. This 24-hour diner is a Hilo institution and rightfully so. We made it our last stop on the way to the airport, and luckily we allowed ourselves enough time to ponder the enormous menu and analyze our choices. Sweet or savory? Breakfast or Plate Lunch or Saimin? I was almost overwhelmed trying to decide. Still smarting from the bad saimin experience at Nori’s, I decided to try Ken’s version of “Hilo Style” saimin, which comes with a side teri chicken stick. For good measure, I threw in a side of corned beef hash and informed Wendy that I’d be stealing a bite of her pancakes, because you can’t come to Ken’s House of Pancakes and not have pancakes. Right? Our smiling waitress (who’s probably been working there for 30 years) took great care of us and everything was delicious. It was a perfect last stop and the whole experience left me with a warm, happy glow as we headed to the airport. I had friends from LA on a cruise ship that made a special point to get to Two Ladies Kitchen when they opened to be sure to get some of their famous strawberry mochi….also, loved Ken’s Pancake House in Hilo…..Sooooo many great choices made it hard to order, but all were yummy and service was great!